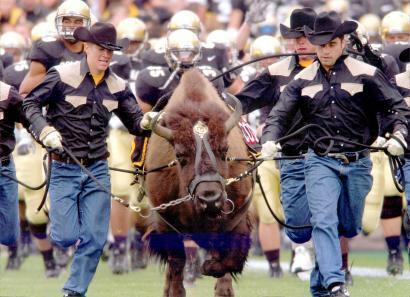 Ralphie the Buffalo is coming to Sanford Stadium! Ralphie IV has run into our fake mascot a couple of times, but that’s been because he wasn’t paying attention," Frei said. "Those have been the only close calls, and fortunately nobody got hurt." Good to know. She only weighs 900 pounds. Lots of people want to talk about her trip. "Their team will come out of the northeast corner and go right to their sideline on the north side, pretty much a direct shot," said UGA athletic marketing director John Bateman. "Ralphie will steer clear of any pregame groups on the field such as our band, cheerleaders and players — and Uga, too." That is a pretty big promise John. I left a message on his cell phone so hopefully he will call me back. And hopefully Ralphie won’t hurt anybody. I’ll be there to watch though – I can tell you that. YAYAYAYAYAYAYAYAYA. 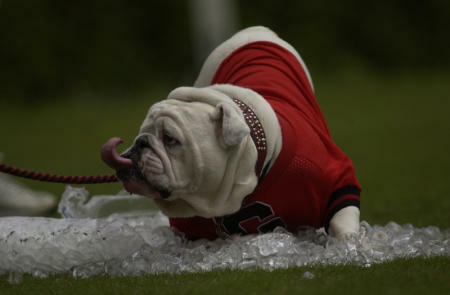 Ralphie has nothing on Uga, the most awesome of all football mascots. "It’s David and Goliath," said Bateman of the mascots’ sizes. "But what’s that old saying, ‘It’s not the size of the dog in the fight, but the size of the fight in the dog’? Uga’s going to stand up tall on Saturday." I’d put money on the fact that Uga is better with children than Ralphie. I’m so excited about another football game, I’m not sure I can talk about it. So. Excited. Bitacle Blog Search Archive – Ralphie the Buffalo is coming to Sanford Stadium! I saw Ralphie the buffalo! Go Dawgs! Watching Ralphie was really exciting. But, UGA was on the prowl…growling at the cowboy waving his flag in our faces. In the end, David beat Goliath! Ralphie IV – cute. Wrangler jeans – gross. Your clock – best fall fashion for 2k6. Seeing you yesterday with your perfect updo – priceless.